A small X-ray telescope was boosted into orbit by an air-launched Pegasus XL rocket Wednesday, the first step in an ambitious low-cost mission to study supermassive black holes believed to be lurking at the cores of galaxies like Earth's Milky Way and to probe the creation of heavy elements in the cataclysmic death throes of massive stars. The innovative telescope, built around an extendable 33-foot-long Tinkertoy-like mast with nested X-ray mirrors on one end and sensitive detectors on the other, also will study the mechanisms responsible for stellar explosions and look for clues about what powers the energetic jets of particles blasted away from some black holes that apparently can disrupt star formation and even galactic evolution. 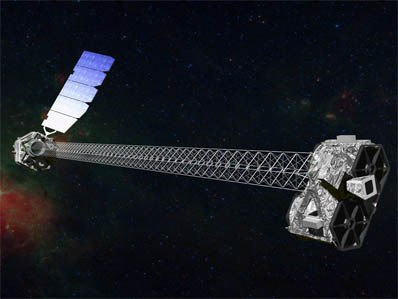 While X-ray telescopes sensitive to lower energies have been operated with great success, the $180 million Nuclear Spectroscopic Telescope Array, or NuStar, is the first space telescope designed to focus higher-energy X-rays like those used for medical imaging and dental X-rays. NuSTAR images are expected to be "10 times crisper and a hundred times more sensitive than any we've had of the cosmos to date," said Fiona Harrison, the principal investigator at the California Institute of Technology. "This will enable Nu-STAR to study some of the hottest, densest and most energetic phenomenon in the universe." The mission got underway with a dramatic pre-dawn launch from an L-1011 jet at an altitude of about 40,000 feet above the Pacific Ocean some 120 miles south of the Kwajalein Atoll in the Marshall Islands. Tucked into the nose cone of a three-stage solid-fuel Pegasus XL rocket, the NuSTAR spacecraft was dropped like a bomb at 12 p.m EDT (GMT-4; 4 a.m. Thursday local time). After a five-second fall, the first stage of the winged Pegasus booster ignited with a rush of flame to begin the steep climb to orbit. 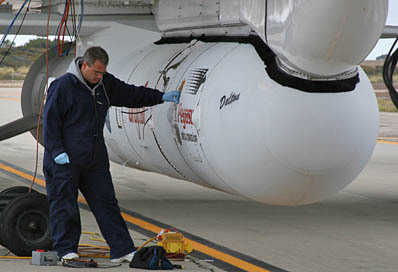 Orbital Sciences Corp. of Dulles, Va., provided the carrier aircraft, the Pegasus XL booster and the NuSTAR satellite to NASA and the mission operations team at the California Institute of Technology under a "Small Explorer" program contract valued at nearly $180 million. The Pacific Ocean launch zone was selected to enable the spacecraft to reach a scientifically favorable orbit tilted just six degrees to the equator. All three stages of the Pegasus booster operated normally, falling away as planned as their propellants were exhausted. Thirteen minutes after launch, NuSTAR was released into its operational 375-mile-high orbit. A few minutes after that, the telescope's transmitter was activated and telemetry confirmed the successful deployment of its five-segment solar array. 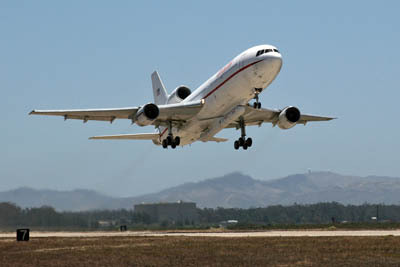 This was the 41st launch of a Pegasus rocket and the 31st using the more powerful XL version. Overall, Pegasus rockets have launched more than 70 satellites since 1990, with 27 successful missions in a row over the past 15 years. "Today was a great day for NuSTAR, a great day for Pegasus, a great day for the entire launch team," said Tim Dunn, NASA's assistant launch director. "We thank Orbital Sciences for the ride, and we're ready to get into the science operation of the NuSTAR mission." Over the next six days, engineers plan to activate and check out NuSTAR's attitude control system, star trackers, solar array drive electronics and instruments. Then, seven days after launch, commands will be sent to deploy the critical open-framework mast that provides the required separation between the telescope's X-ray mirrors and its detectors. Unlike optical telescopes that use mirrors to bounce starlight to detectors, penetrating X-rays are focused by cylindrical, nested mirrors that cause a very slight deviation in the trajectory of the incoming radiation. A relatively long focal length is required to achieve the sensitivity astronomers need. NuSTAR's ability to detect high-energy X-rays is the result of improved mirror and detector technology. But its ability to be launched by a small, relatively low-cost rocket is the result of an innovative design incorporating an extendable mast, built by ATK Aerospace Systems, that was originally developed for a shuttle radar mapping mission. Earlier X-ray telescopes, sensitive to lower energies, were built around fixed structures and required large launch vehicles. NASA's Chandra X-ray Observatory, for example, weighed more than six tons and was launched by the shuttle Columbia. NuSTAR weighs just 770 pounds. The mast providing the required separation between mirror and detectors was designed to fit inside a 3.3-foot-tall canister at launch. Assuming the 25-minute mast deploy sequence works properly next week, engineers will carefully align the optics and detectors. Science operations are expected to begin in about 30 days. "One of NuSTAR's primary science goals is to study black holes (and) the extreme physics, the fascinating physics that occurs very close to the black hole where spacetime is severely distorted and particles are accelerated close to the speed of light," Harrison said. "And also to understand how black holes are distributed throughout the universe." While galactic blacks holes initially were thought to be rare, "in the last 15 years, we understand that there is a very massive black hole at the center of every galaxy like our Milky Way," Harrison said. "And not only that, these black holes influence the way these galaxies grow and form." While black holes are, by definition, invisible due to gravity so intense not even light can escape, they can be detected by looking for the radiation that is generated as gas and dust are sucked in and heated to extreme temperatures by friction with other in-falling material. "What you're actually seeing is the dust and gas, the material in the galaxy, that's attracted by the black hole's gravity," Harrison said. "Close to the black hole, it organizes itself into a disk and friction turns this gravitational energy into heat. The material heats up such that when you're closest to the black hole, just a few times further away than the event horizon itself, the material is radiating high energy X-rays." Combining NuSTAR's images with those captured by other, lower-energy X-ray telescopes, scientists will be able to "study the entire X-ray spectrum," Harrison said, "we can watch atoms circulate in the closest orbits near the black hole, we can observe how spacetime distorts our view of these objects and tell things like how fast the black hole is spinning." NuSTAR will also focus on a variety of other energetic phenomenon, including the mechanisms responsible for the creation of heavy elements in supernova explosions and those powering the unimaginable jets of particles boosted to near light speed in the vicinity of black holes and other collapsed bodies like neutron stars and spinning pulsars, the left-over cores of stars destroyed in supernova blasts. NuSTAR's state-of-the-art mirrors and detectors will help astronomers bring their views of the high-energy universe into much sharper focus. "It's like you're trying to read a book without your glasses," Harrison said. "You know there's text there, but you can't make out the letters. Currently, we can make out about 2 percent of this cosmic text. But with NuSTAR, we'll be able to make out the majority of the story, we'll be able to image the sky, read the story and understand things like how galaxies form, how black holes grow and the history of the high energy universe." The mission is expected to last at least two years.